20 Bees Winery is a 100% homegrown winery located in the Niagara Winescape. 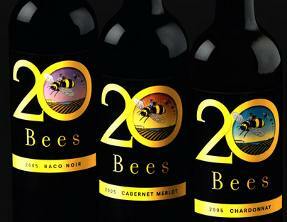 All the wines produced at 20 Bees is VQA approved and made from local grapes, which are harvested by the local growers. This regional winery was established in 2004 by a group of grape growers who wanted to start their own winery. Their philosophy is the nurture the vines, harvest the grapes and produce the great-tasting wines at fair price. The main grape varietals used include Chardonnay, Riesling, Cabernet Merlot, Baco Noir, Pinot Grigio, and Vidal.